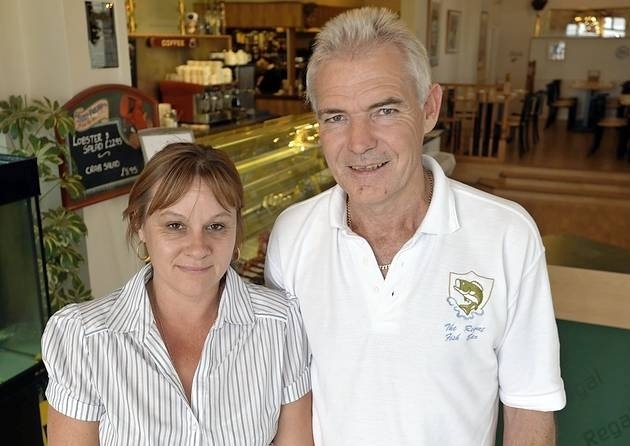 Dawn and Kevin Barrett welcome you to the regal fish bar and restaurant official website. We are a small family run business located along Felixstowe seafront. Please feel free to have a look around our website and see a “little taster” of what the regal fish bar and restaurant have to offer. If you have already visited The Regal, please do not hesitate to leave any comments regarding your experience. If you have any more inquiries, you can find our telephone details and email addresses on our Contact Us page. The Regal what can one say about this place, well the best fish and chips in Suffolk the staff cannot be faulted there is always a very warm welcome friendly faces. Nothing to much trouble, have to go there to appreciate this place. David . A very enjoyable meal, super location on the seafront with interesting views from the first floor restaurant. Excellent unparalleled customer service. Many thanks. Can’t beat the regal for fish and chips.the staff are so friendly &helpful. We travel from Hadleigh just to go and get our fish &chips. First visit & it won’t be the last! Faultless! Service,Food, Staff, what more can I add! P.S. The website’s pretty good too! I had not been to Felixstowe for over 20 years then this year have been 3 times. I used to use the Regal back in the 80’s and was pleased to find that although there has been a change of ownership and a re fit the standard of food is higher than ever. The excellent food at The Regal means in future I shall be coming to Felixstowe much more often the drive from Birmingham is well worth it! Delboy and Mick Two essex bikers can highly recommend the regal for fantastic fish and chips good ride out come on down. The best shepherd’s pie ever, and what a great selection of veg – cooked perfectly! Thank you. We have been customers of the takeaway for years but yesterday was the first time we have eaten in the restaurant. We were lucky enough to be the only people upstairs so had a lovely, peaceful time. The fire was burning, the Christmas tree was twinkling and the waves were crashing outside the window. Brilliant. As with the takeaway, the customer service was lovely and friendly, add to this fantastic views, nostalgic photos, a lovely clean restaurant and toilets (love the very thoughtful double seated toilets to accommodate children as well) and as always, THE BIGGEST AND BEST FISH AND CHIPS WE HAVE EVER TASTED!!!! Pps – We didn’t need any tea last night! We have visited The Regal 3 times in the last few months and have not been disappointed. The staff are very polite and helpful and the food is very tasty. Would definitely recommend. I went into this restaurant with my wife on Sunday 17th of may. Don’t get me wrong, the food and the main service is fantastic And it is wonderfully set out. Having said this there was a certain incedent I unfortunately had to witness of a staff member completely degrading another unprofessionally in front of a whole, very busy restaurant. I understand things happen behind the scenes we weren’t all born yesterday especially at my age but to witness this was in my eyes a form of bullying and very much so out of order. No staff member was rude to me personally but from one staff member to another this was not what I wanted to witness whilst having a meal out. This poor waitress was clearly trying to take a few orders at once to stop the moaning of which we did hear on the table next to us. It didn’t bother my wife and I as we could see how busy and possibly short staffed they were. As a table was moaning about the wait I know a waitress went to check how long they had actually been waiting which we knew wasn’t as long as they said. I don’t know the inns and outs but what I do know is this staff member should of been spoken to in a more professional manner in front of customers or taken completely away out of view to be spoken to. For this reason my wife and I will only be using the takeaway from now on. Bullying is not something we will choose to witness whilst having a meal out especially between staff members. Really sorry to hear that you were not satisfied with your meal. Unfortunately it is that time of year where we have new potatoes coming in and they do tend to get soggy. The boys have been spoken to about cooking them a bit longer. We would like to offer you a free meal or a voucher for the inconvenience. Please pop in and see us at the regal. Hi what are your opening hours over Christmas & New Year please? We are closed Christmas day and Boxing day. New year’s day we are from 11am – 4.15pm. All other days are our usual hours. Very tasty fish and chips by far. Generous portions. Would recommend this place. Very pleased and full. A group of us went to The Regal at start of August for our monthly getogether and also to celebrate a Golden Wedding Anniversary. Well what can we say about The Regal the staff are fantastic and the owners are wonderful food is excellent and very hot when it comes to the table, we took a Anniversary Cake with us for the people who was celebrating their Golden Wedding and Dawn took it and put it out back till we were ready for it then brought it to the table with plates and napkins. So we’d like to say a very big thankyou to everyone at The Regal for a fantastic night. We loved the fish and chips and would definitely return. Both the fish and the chips were lovely, nice crisp batter and chips which were just as we like them. Service was very good. We travelled from Ely for a day out and this meal made our day. Have told our friends, who travel from Cambridge to Felixtowe fairly often. Lovely friendly staff. Great choice of good traditional food and especially our favourite fish n chips. Becoming a regular outing from home in Ipswich.